We all know that diamonds are a girls best friend and if it’s one thing that girls does not want, it’s to not get there precious pieces of jewellery damaged and dirty. Therefore, to make it easier to maintain your delicate sentiments, below are a few easy steps on how to clean your diamond jewellery. Make a mix of warm water and a mild detergent. Place the diamond jewellery in the bowl filled with the mixture. Always use a mild cleanser to clean your diamond; jewellery stores use diluted ammonia to clean with. The easiest ways for you to replicate this at home is by using Windex and mix it with hot water. The heat in the water will loosen up any oils on the stone. Just be careful that any cleaning fluid you use doesn't react with any metals the diamond is embedded in. Some cleaning fluids can discolour the metal if you're not careful. 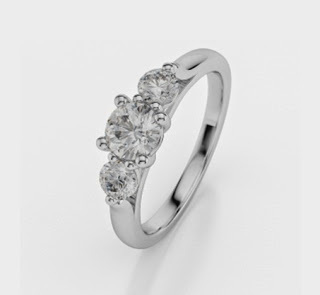 Platinum, gold and rhodium jewellery tend to be the most resistant to cleaning fluids than other precious or semi-precious metals. Try not to touch the stone with your fingers; handle the diamond ring, bracelet or necklace by the edges. Use a soft brush, soap and water, if you don't already have a special brush for cleaning jewellery, you can use a soft toothbrush. An eyebrow or even a lipstick brush will even work, as these are soft and small, which make a good substitute. However, insure that any brush you use is clean and does not have makeup on it. Soak the diamond jewellery for a few minutes. Then scrub with a brush. Make sure to get under the stone too, as this is where the dirt and oils will gather. To rinse diamond jewellery, use a fine-mesh strainer. Use a clean cloth to dry the jewellery. While the diamond itself will not usually be scratched by paper towels or tissues, any other embellishments on the jewellery piece may be, so it makes good sense to stick to using a soft cloth, preferably a jewellery polishing cloth, for the whole piece.